The Institute of Biomedical Engineering at the University of New Brunswick was recently named the province’s Innovation Champion at the Knowledge and Innovation Recognition Awards, continuing a legacy of more than 50 years of leading-edge research. The awards, known as the KIRAs, were presented May 4, 2017 at a gala event at the Fredericton Convention Centre, saluting innovation across all sectors and industries in New Brunswick. Since its founding at the University of New Brunswick in 1965, the institute has become world renowned for advancing the science of prosthetics. The multi-disciplinary research centre, involved in a broad spectrum of activities in biomedical engineering, furthers education, research and community service in biomedical engineering. “I’m most excited for what’s to come. Innovation in health and medical technology is essential to the future of our province,” Dr. Englehart said. Dr. Campbell said the award reflects UNB’s reputation as a hub for innovation and an incubator of entrepreneurship. Saint John startup firm EhEye, whose chief executive is an alumnus of UNB, picked up two awards of its own, for Most Innovative Startup and Innovation Through Technology. CEO James Stewart has three degrees from the university, earning his bachelor of science degree in 1997, followed by a master’s in computer science in 1999 and then his doctorate in 2017. EhEye is pioneering technology that allows video feeds to be analyzed for cues and behaviours that might presage violence. As a former crime analyst with the Saint John Police Force, Mr. Stewart saw a gap in the existing technology and decided to fill it himself. The KIRAs celebrates excellence in technological, social and economic innovation across all sectors and industries in New Brunswick. The awards recognize companies, organizations, and individuals in New Brunswick for their role in the development and/or application of innovative products, processes, services, technologies, or business models. KIRA seeks to encourage and foster a culture of knowledge and innovation in New Brunswick. 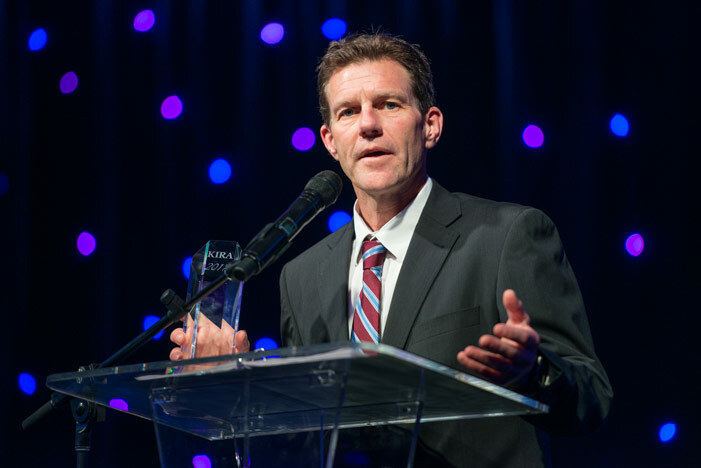 Photo: Kevin Englehart, director of the Institute of Biomedical Engineering at the University of New Brunswick, accepts a KIRA award saluting the institute as Innovation Champion. Photo courtesy of KIRA.